Here you can specify a new name for the theme path (/wp-content/themes/theme-name/). All the default theme paths in your source code will be replaced with this new name. For example: /wp-content/themes/twentysixteen/style.css will be replaced with /template/style.css or wp-content/themes/twentysixteen/images/png/logo.png will change to /template/images/png/logo.png. You can also use nested folders like test/static/skins/. This option depends on New theme path. In addition to the theme path you can also change theme’s stylesheet URL. If new theme path is ‘/template’ and set ‘New style name’ to ‘main.css’ then the stylesheet URL will be //template/main.css. You can rename it to main.css or use a different path like /styles/css/main.css. You can also use any extension or no extension at all (e.g. /path/style.php or /style). Enter here the stylesheet (for new stylesheet name created above) expiry header in days for browser caching. This option depends on New style name. If you change style name you can also minify its content. Almost all of style.css files have some information about the theme and its author. This information is publicly available and anybody can easily know this is a WordPress theme. This option not only removes this information but it also deletes white spaces and other CSS comments so your site will be a little faster. You can enter new name for /wp-includes path here. For example: change /wp-includes/js/jquery/jquery.js to /other/js/jquery/jquery.js. It’s also possible to use new theme path as a base for this folder. For example if your ‘new theme path’ is /template you can use template/lib/. This option helps you to change plugin path /wp-content/plugins/ to something else. For example: change /wp-content/plugins/plugin-name/style.css to /ext/style.css. It’s also possible to use new theme path as a base for this folder. For example if your ‘new theme path’ is /template you can use template/ext/ here. Even if you rename plugin pat,h it’s still possible for others to know which plugins are active in your site. Enabling this option will replace the paths like /wp-content/plugins/woocommerce/ to something like /modules/2hg1t7/. This option will change /wp-content/uploads/ to something else. For example: change /wp-content/uploads/2018/12/logo.jpg to /file/2018/12/logo.jpg. Please note that this option is totally different from WordPress change upload directory located in Settings >> Media. As opposed to upload path in WordPress this option won’t change physical location. If you check the post’s source code you will see that WordPress uses wp_comments_post.php to receive comments from visitors. Hide My WP let you change this file name. In some cases this option may even work as an effective anti-spam technique. Almost all of AJAX operations both in frontend and backend of WordPress is handle by /wp-admin/admin_ajax.php. You can change this path to anything else. Here, ajax.php, /folder/my_ajax.php, /ajax/ are all valid inputs. With this you can rename /wp-content path to something else. This is useful only for some plugins like cache or gallery plugin. click on “I did it! login to new dashboard” button, and login again. Note: Copy & save the URL (bold green) in the page above. 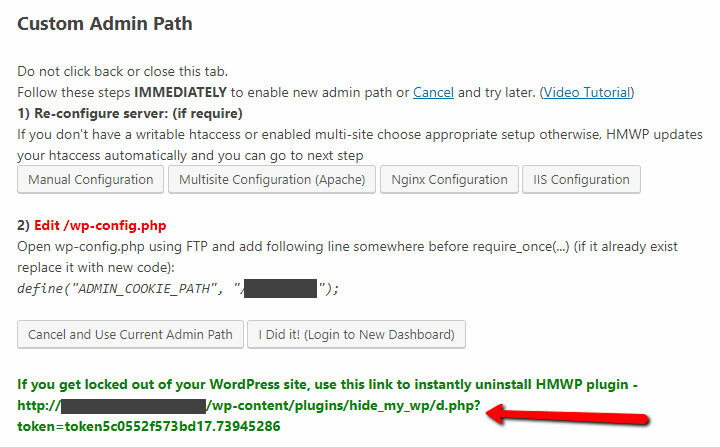 This URL can be used to reset HMWP if in case you are locked out. You can enable or disable REST API. If you enable it then you can set new names for “API Base” and “API Query”. You can enable or disable authors’ links. If you enable it then you can set new names for “Author Base” and “Author Query”. WordPress uses empty Page Base by default (www.YourDomain.com/sample-page) when you enable this option it’s hard for it to know which URL refer to an author and which one belongs to a page. Thus if you want this option you should enter something as Page Base (e.g.domain.com/base/sample-page). For the same reason, you can’t use %post_name% or %postid% alone as Post Permalink. You should add something before or after to make them work. For example both ‘/archive/%postid%’ or ‘/%year/%post_name%’ are acceptable. Just like author link you can enable/disable feeds too. This apply to all feeds (global feeds, category feeds, comments feed, etc.). When enabled, then you can set new names for “Feed Base” and “Feed Query”. Here you can overwrite WordPress permalink structure and change the famous ‘/?p=123’ URLs. If you disable post URLs no one can see a single post and therefore no one can comment but archive pages and blog pages may still display posts. Please note if you use author without base feature you should not use %post_name% or %postid% alone as Post Permalink. Add something before or after to make them work. For example both ‘/archive/%postid%’ or ‘/%year/%post_name%’ are acceptable. Pages URL can be enabled/disabled using this option. WordPress doesn’t use any base for pages by default. If you enter something as Page Base then links like /sample-page will be changed to /your-base/sample-page. This may not be so great, but if you enable author without base it’s required to add something as Page Base. Please note ‘Page Base’ and ‘Paginate Base’ should have two different values. When you have lots of posts WordPress needs to paginate them. You see links like Older Entries or Next Posts in front page, category pages, archive pages, etc. It’s possible to disable or change these URLs here but note that Page and Paginate should have different values for both base and query. Just like others, you can disable or change these URLs. 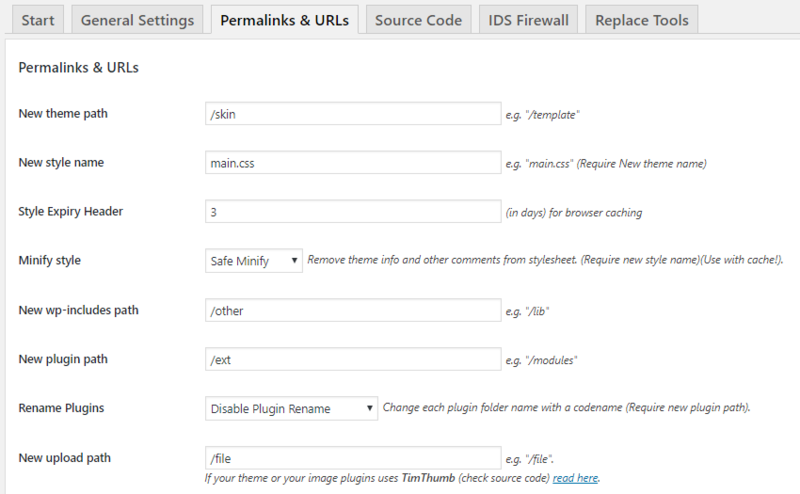 Category and tag bases will overwrite WordPress permalink option. Search base will be used when you enable ‘Search base redirect’ option. If this option is enabled and user hits search button in the website, he/she will be redirected to /search-base/keyword. This is prettier than default search query (/?s=keyword) and we recommend to use it. You can’t change archive URLs in HMWP but it’s possible to disable them. This option will disable daily, monthly, yearly, hourly pages. It doesn’t affect categories, tags and taxonomies. There is still some more components you can disable with HMWP. Things like attachments, post types, taxonomies and comment pages can be disable here. It’s important to know most of the themes and plugins use post types and taxonomies for different purposes. Choosing this option make them unusable. In most cases you don’t need this feature.